DISTRICT OF COLUMBIA (AP) — Western Democrats are pressuring President Donald Trump not to rescind land protections put in place by President Barack Obama, including Utah’s Bears Ears National Monument, a designation strongly opposed by Utah Republicans. Obama infuriated Utah Republicans when he created the monument in late December 2016. 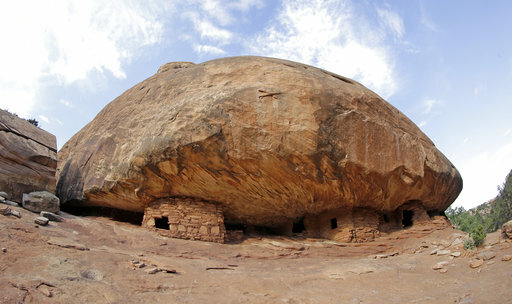 While the 1.3 million acres of land is sacred to Native Americans and home to tens of thousands of archaeological sites, including ancient cliff dwellings, and found support among some Native Americans, other Native Americans in San Juan County where the monument is located opposed the monument. Republicans have asked Trump to take the unusual step of reversing the designation, saying it will add another layer of unnecessary federal control and close the area to new energy development. “This is especially true in the case of Bears Ears National Monument, for the Native American tribes who call this living cultural landscape their ancestral home,” the Democratic senators wrote. Many Utahns, however, including Native Americans, opposed the monument. Rebecca Benally, a Navajo and a San Juan County commissioner, said President Obama would not be designating the monument for the local people, St. George News reported in December, but for groups that are using the Navajo to further their own agenda. “My constituents do not want another national monument,” Benally said at the time. In an ongoing back-and-forth with Republicans over the monument, Democrats on the House Natural Resources Committee released documents Thursday to try to bolster their argument that there was adequate consultation. The documents from Arizona Rep. Raul Grijalva, the senior Democrat on the panel, detail repeated phone calls and visits between the Obama administration and Utah’s congressional delegation and governor. Democrats said the back-and-forth showed collaboration. “If anyone wants to paint Bears Ears National Monument as a surprise or the product of rushed or incomplete planning, they’ll have to explain hundreds of emails and dozens of pages of shared work product,” Grijalva said. In a statement Thursday, Paul Edwards, Herbert’s deputy chief of staff, said the documents released by Democrats illustrate that the state, the congressional delegation and the Interior Department worked for three years to try and find a solution together. “The state of Utah is ready and willing to pick up the baton and work to resolve these issues through a fair, negotiated, legislative process once again,” Edwards said. A spokeswoman for Interior Secretary Ryan Zinke said Thursday he’s committed to traveling to Utah and other states to make recommendations for the president. Written by MARY CLARE JALONICK, Associated Press. Associated Press writer Brady McCombs contributed to this report from Salt Lake City. ST. GEORGE NEWS senior reporter Mori Kessler contributed to this report from St. George. AP content: Copyright 2017 The Associated Press. All rights reserved. This material may not be published, broadcast, rewritten or redistributed. Of course the Democrats don’t want to see anything done to curtail the government from control of anything! They believe that government is the Big Daddy that will take care of everything, if just given the chance. They believe that we would all live in Utopia today, if not for those pesky Republicans! Just cut it down to a more reasonable size, and make everyone equally unhappy. Now this is a most sensible suggestion. Surely these elected officials can settle on much less than the massive land grab Obama laid out. Of course he would be hard put to tell you where it is and why it was so important, but then that is the socialist way. the socialist way huh? I’d be curious if we tallied up what you’re costing the tax payers every single year. A fully socialist state pension plan and paid health insurance are not cheap. Trump should use this action as a bargaining chip with the Dems. Leave it in a reduced size if Dems will help fix Obama care. Negotiation requires give and take.